It's 7 a.m. and I'm lying in bed, sleepy-eyed. Max is snuggled into the crook of my right arm, watching Mickey Mouse Clubhouse. It's become our little morning ritual, just the two of us. Dave is showering and Sabrina is downstairs watching Spongebob Squarepants because she thinks she is far too mature for Mickey Mouse Clubhouse. I practically have to bribe Sabrina to get kisses, but Max is such a snugglebunny. Whenever I walk in the door after being away he lets out a squeal, runs to me and presses himself against my knees, wanting me to pick him up. Once I do, he nestles his head on my shoulder, opens his mouth and plants it onto my neck. Then he breathes in and out deeply, like he is trying to inhale me. It is the most heavenly feeling. Max took a long time to learn how to kiss. He still can't do it with pursed lips; all of his kisses are of the open-mouthed, slurpy variety. They leave a big wet mark on my cheek that I don't always bother to wipe off. As kissy as Max can be, he has never hugged me. It's just not in his repertoire of movements; the cerebral palsy keeps his arms close to his sides most of the time. Yet I don't feel like I'm missing out, or that I've been deprived of some primal parental right. I didn't even realize until recently that Max had never hugged me. Then one night, when I leaned down to kiss him good night, he flung one arm over my back and it occurred to me that was as close of a hug as I'd ever had from him. If you'd told me when Max was a baby that he would not be able to hug me, I would have been despondent. A child? Who cannot hug his mother? But the lack of hugs are yet another thing I've never had regrets about because there has been so much else to take their place. Our children love us up any way they can, whether or not they're able to wrap their arms around us or say the words "I love you." I may not get hugs, but I do have squeals of joy when I walk in the door. I have that light in Max's eyes when he sees me. I have lots and lots and lots of slurpy kisses. I have a little boy who loves to snuggle with me. I'd take squeals of joy--if I come back from a trip Charlie acts like he's never heard of me. Stinker. Only exception to that rule is the time I was gone for a week and he flat-out screamed at me when I came in the room. BTW, it's me, Ellen; I'm just signed into the wrong account! P.S We will be posting a video soon of us opening our Video!! And pictures. That's so sweet and wonderful. I'd add that as the mother of a child who can't kiss or squeal or use her arms to hug, well, it's also in the eyes and there's something so delicious about being able to hug and stroke my daughter despite the fact that she's almost fifteen years old! Wonderful perspective, as always. You do need to write a book! Snuggles and wet kisses are the order of the day in our house and I love every single one of them. I understand about the 'breathing you in' too. Actions speak louder than words. It is good to be reminded of that:) Jen. Both of my kids are snugglers. Noah in the must-be-touching-me-almost-always-stroking-my-hair variety and Addison in the let-me-sit-on-your-lap-especially-if-you-think-you're-busy variety. She gives the open mouth kiss with an occasional bite. We are so so lucky! Emmett does that - he buries his face in my neck and breathes me in. Words can't describe how it makes me feel when he does this. Such a sweet boy! Faith doesn't close her mouth either so she gives wet kisses, too! LOL! LOVE THEM! So sweet! I have a snuggle bunny, too. 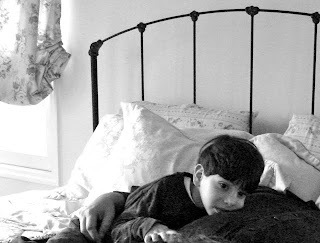 And although my Isaiah will probably never utter the words, "I love you, Mama", when he grabs the back of my neck , pulls me to his face, and gives me that special smile he saves just for me--there is no need for a single word. That's exquisite. It's so important to see the richness of what we do have right in front of us! I don't think I ever looked into people's eyes deeply until I had Ben. Oh, Ellen! I am in tears. What a precious post! Thank you for such a sweet reminder of the many colors of love. There's only one rule to kisses in this house...the sloppier the better!! I get some kisses here, that would make any college girl jealous! what a lovely post! thank you - needed that today! Oh, please don't get me started about Max's kisses - they are de-lish!! I would beg him for one when he would not give it to me voluntarily and I would always welcome one, even if he wanted to kiss me with a mouth full of food!! I also love seeing how he snuggles into Ellen's shoulder when she picks him up - he has this dreamy look on his face and you just know he is just loving Ellen and being close to her. The bright eyes and squeals of joy are also totally yummy. He is such a warm and loving boy! !